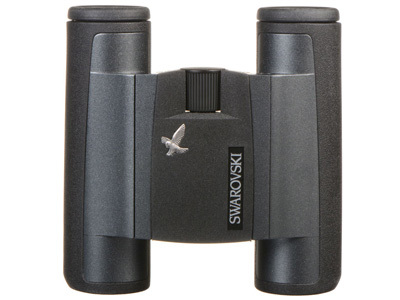 The Swarovski Optik 10x25 CL Pocket Mountain Binocular is a lightweight and convenient optic for mid-range use that combines the quality construction and viewing precision that nature enthusiasts have come to expect. To help offset the high power and relatively small objectives, and to ensure bright and crisp views, the CL Mountains utilize the iconic Swarovski SWAROBRIGHT, SWAROTOP, and SWARODUR lens coatings. These coatings work together to produce bright and clear high-contrast images with accurate colour rendition across the entire field of view. This addition to the CL family features a dual-hinge bridge that allows the optical barrels to fold tightly underneath for space-saving compact footprint that can easily fit in a pocket, pack, or purse. The folding bridge design also gives them a broad interpupillary range to accommodate a wide range of users from children to adults. To withstand the rigours of the outdoors, the lightweight aluminum chassis is wrapped in a protective rubber armour accented with textured palm pads to improve its slip-resistant grip. The optical tubes are nitrogen-filled and O-ring sealed to be waterproof to a depth of 13-feet, while being resistant to internal fogging when moving through extreme temperature changes or environmental conditions. Interpupillary Adjustment 50.0 - 74.0 mm / 2.0 - 2.9"
Box Dimensions (LxWxH) 7.7 x 7.2 x 3.2"